Now about 50 years old, the tree pictured here was but a small fir when it was planted to the right of the main entrance to the Wayne Primary School. The planting was done at the instigation of a woman deeply interested in civic affairs, Mrs. William B. Riley, who lived for many years on Pembroke avenue. In choosing the location for this tree, Mrs. Riley selected a spot where there would be ample space for carollers to gather around it, even after the tree had reached maturity. Though never a tree to be lighted at night, it created a center for outdoor Christmas music for several years. 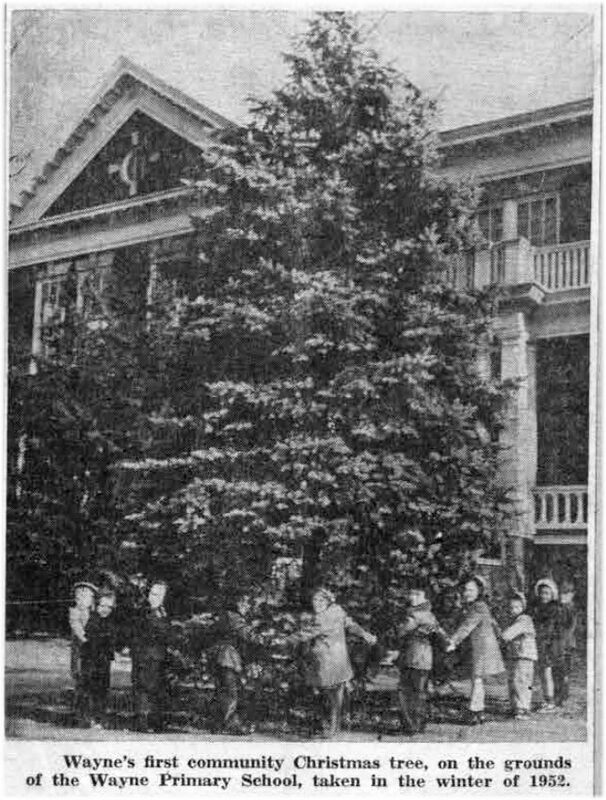 After it was deserted for a more centrally located community tree, it became the “birds’ Christmas tree,” decorated with tid-bits of food for the feathered friends of the school children. This trimming of the tree for birds remained a custom until a few years ago. The light from this fine Nordman fir tree first shone out four years ago. It was preceded by a temporary and very short-lived one, lighted in December, 1950. The permanent tree was finally chosen by a committee from the association after a tour of all the nearby nurseries had been made. And even then, the choice had to be verified by a second group. 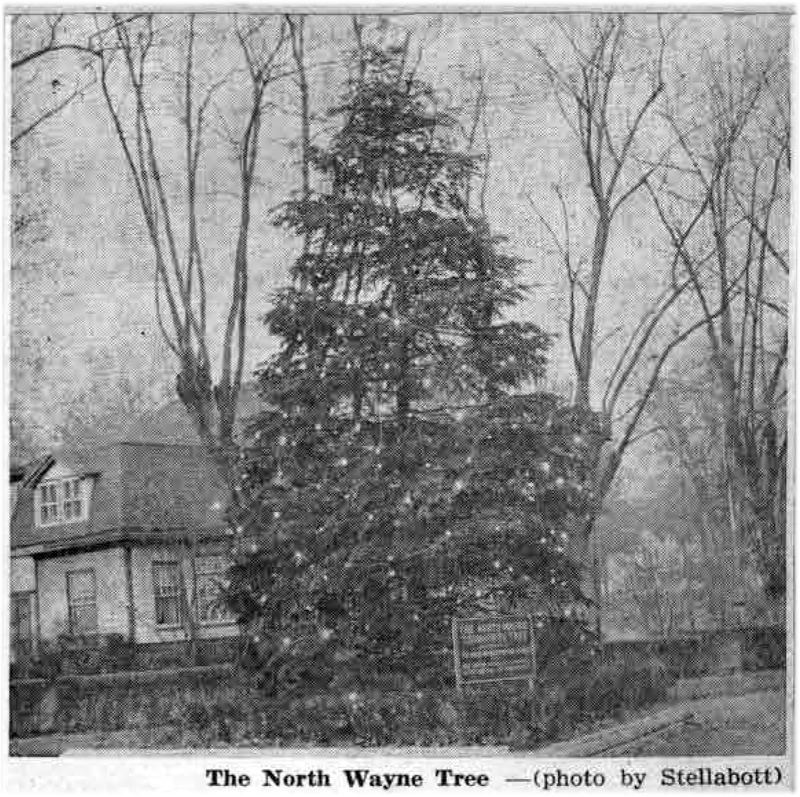 Once purchased, this fir became a very personal possession of the neighborhood, as exemplified by the fact that during the dry summer of 1952, members of the North Wayne Protective Association took turns watering it through pipes sunk deep into the ground for that purpose. Among the other trees in this vicinity that are lighted up each Christmas time is one in Wayne Terraces, sponsored by that community’s civic association. The annual Christmas celebration was held this year on Saturday morning, December 17, when Santa Claus arrived on a fire engine from the Radnor Fire Company. As the clear white light of the star of Bethlehem shone forth from the top of the big Douglas fir tree, in front of the Wayne Presbyterian Chapel last Friday evening, to mark the beginning of Christmas week, Wayne could rejoice for the fourth season in a community Christmas tree of its own. Over the years there have been other trees, but, with the careful selection of both tree and site made in 1952 with a view to the longevity of both, this one should endure for many years. The tree is a gift to Wayne made by Mr. and Mrs. E. Mortimer Newlin in memory of their son, Frank Battles Newlin. Several members of the Community Garden Club at Wayne were on the committee which selected the variety of tree which should be chosen and the site it was to occupy. Finally a Douglas fir, of the largest dimensions that could be transplanted was picked from the William H. Doyle Nurseries in Berwyn. In deciding upon a location for the tree, many possible ones alone Lancaster pike had to be ruled out because of plans for the future widening of the highways. The one finally chosen is just to the left of the entrance to one of the community’s oldest churches, the chapel of the Wayne Presbyterian Church, built about 90 years ago on ground donated by J. Henry Askin, founder of Wayne. With its twinkling, multicolored lights, below the clear white star at its tip, the tree is a beautiful sight, enjoyed alike by Wayne residents and the many passersby along the highway. 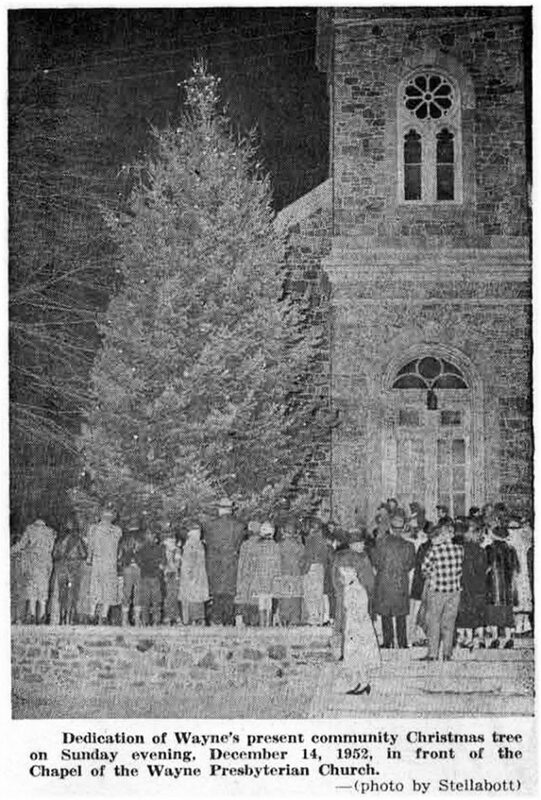 It was dedicated on Sunday evening, December 14, 1952, as the group of carolers, young and old, sang, strains of “Oh, Come All Ye Faithful,” under the direction of Jesse Zerr, of the music department of Radnor High School. This tree’s immediate predecessor was the well-remembered giant fir tree, located where Halligan’s toy store now stands. In December 1922, carol singers gathered around it when it was lighted for the first time. Edgar L. Hunt, then organist at St. Mary’s Church and music instructor at Radnor High School, led the group singing, a custom that was to continue for some years. Many felt that this tree and the ground around it should in some fashion have become the property of the township. But this was not to be. A tree on the Louella Court grounds, located near the old mansion, was considered the community Christmas tree for some years before the one just described took its place. It was around the Louella Court tree that groups of young carollers had been accustomed to gather as they made their rounds along the streets of Wayne and St. Davids, before arriving at St. Mary’s Church in time for the Christmas midnight service. 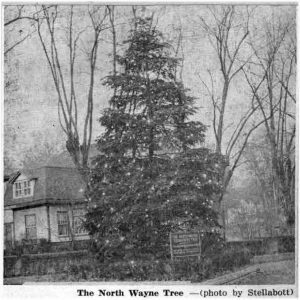 The first Wayne Community Christmas Tree was one planned in the early 1900’s, on the grounds of the Wayne Primary School, at the intersection South Wayne avenue and Windermere avenue. The story of this tree will be told in next week’s column in addition to that of the handsome North Wayne tree and several others in the immediate area. Public interest in the future of the old King of Prussia Inn has been stirred anew in this area by recent newspaper reports that construction will begin shortly on a Howard Johnson restaurant at the northeast corner of Route 202 and 23, in the center of the King of Prussia area. This newest link in the restaurant chain will cost $100,000, and is scheduled to be completed by April 1, with a seating capacity of 88. The site for this building will be the Alexander H. Crockett property, on which another historic building already stands. Possible demolition of this building is one of the motivating factors for a group of interested neighbors in Montgomery County to seek a temporary injunction against the erection of the new structure. 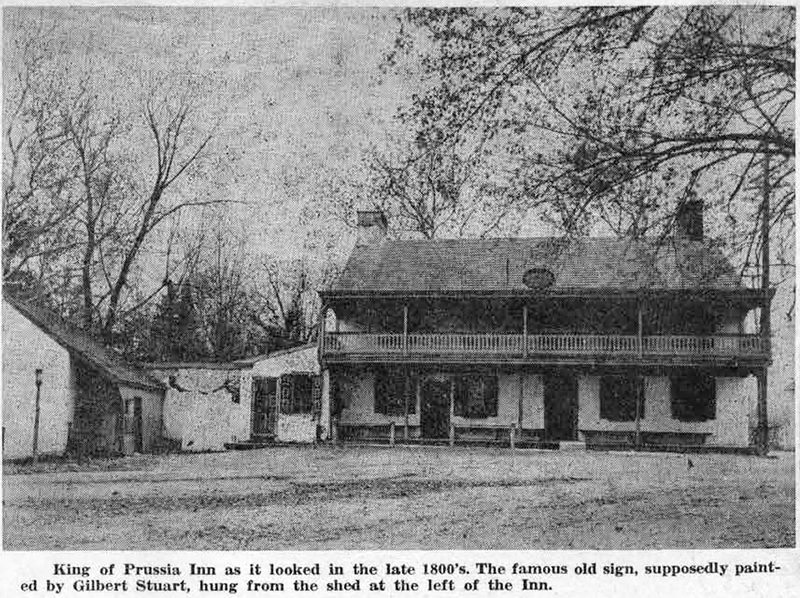 This is but another angle to the general problem created by the transformation of the comparatively quiet crossroads of yesterday by today’s introduction of feeder highways to the Pennsylvania Turnpike and the Schuylkill Expressway, with the fate of the historic King of Prussia Inn the main matter of concern. This old inn, which is now left standing on the island between Routes 202 and 23, was recently sold to the Pennsylvania State Highway Department by its former owner, Mrs. Anna P. Waters. At first the inn was slated for destruction in plans to widen Route 202. Later rulings permitted it to remain on its original site. The present state highway ruling, as your columnist understands it, is that the building may be sold for a nominal sum to any responsible group who will provide proper future care for it. There is much current interest among a large group of Montgomery County residents to see this plan consummated. Since only brief allusions to the history of this hostelry have been made in this column in the past, this time of renewed interest in its future seems an appropriate one in which to attempt such a history. Much valuable information in regard to it has been furnished by Dr. Robert W. May, president of the newly organized King of Prussia Historical Society, who has made available material from the Montgomery County Historical Society and other sources. The picture shown with today’s column is a remarkably clear one, lent to the writer some time ago, with the information that it was probably taken about 1890. Seen at the extreme left in the picture is the Inn’s old signboard, hanging at that time just under the eaves of the shed adjoining the main building. In later years it was moved to the front of the building itself. Whether the sign was really painted by Stuart seems as open to question as the date of the building of the Inn, a date which varies from 1700 to 1769, according to different authorities. It seems to be generally conceded, however, that it was originally built at approximately the first date mentioned, and remodelled, or perhaps rebuilt, on the second date. “More than 50 years have passed since Dr. Henry DeWitt Pawling was laid to rest in Montgomery Cemetery. Yet there are still old cronies who like to put their silver heads together and refresh their memories of a beloved physician. “For many years he was the family doctor of the King of Prussia section. The chief alleviation of one’s woes was the fact that Dr. Pawling would be sent for. A tall, sturdy figure – a long beard flecked with gray, surmounted by a closely shaven upper lip, a strong, straight nose, and a pair of the most quizzical, piercing brown eyes, ‘eagle eyes,’ as Dr. Drake, of Norristown, characterized them, he was always dressed in black – a sort of frock coat, buttoned high in the neck and having huge pockets in the back. “A hand on your forehead was enough. He needed no clinical thermometer of later invention to know how high the fever ran. Your tongue was ordered out for inspection. And out it came, although you had been taught that to do so was the height of bad manners in any child. A few questions, and then the doctor got into action. “From a side pocket he drew a roll of white papers. One of them he folded carefully and tore into a dozen or so little squares, which he laid along the side of a nearby table. From the bulging coat-tail pocket he drew a large bundle wrapped in black oil-cloth ancl tied with black tape. When opened, it displayed a lot of packets, all labelled and containing his favorite remedies. With a point of a broad short knife, he estimated exactly the proper amount of the drug he wanted, perhaps adding another kind, too. Then he folded each dose in its own little paper, and gave them to your mother with instructions. No fuss – no prescription – what would have been the use, with the only drug store six miles off, and only a horse to carry you there? Now a little chat – a couple of jokes – and he was off. “Transportation was a problem in those days,” she writes. “The doctor was so often begged to give a lift that it finally became a serious tax upon his horses. So he had a narrow little buggy made, holding only one person – himself! And that was that. “He remembered all the babies he assisted into the world, and carried candy and pretzels for them in hls capacious pockets. Hundreds of the boy babies were named after him by proud and grateful fathers. Mrs. Suffren continues, “He was of a nervous temperament, and could be a bit gruff at times. Too busy to attend to collection, he employed a Mr. Murray to do this work. One night, very late, as the weary man went to shut his office door on the last of the night’s crop of patients, in came another one, a man who had little the matter with him, yet haunted the office. The over-wrought doctor turned on him, saying, ‘What makes you come here all the time? Don’t you know you are going to die anyway?’ The poor fellow faced about and went out. Then he encountered Mr. Murray coming in. The latter noticed his woeful countenance and asked him what was the matter. After Murray had consoled the patient he took him back into the office when the doctor only laughed and asked if we were not all going to die sometime. Much cheered up, the patient left. And Mr. Murray gave Dr. Pawling a good scolding together with the day’s collection.